Thanks to author of the DCJY Ultimate Guide/DreamPod co-host/intrepid reporter Mike Phelan for this news. Today he braved the incessant rain of the British summer and ventured to his local branch of comic book/sci-fi emporium Forbidden Planet, and was met with an awesome selection of Dreamcast-related merchandise. We knew about the Megadrive branded stuff they were selling previously, but this Dreamcast range was news to us! T-shirts, mugs, wallets, coasters, greetings cards, travel pass and passport holders - all emblazoned with Dreamcast, Jet Set Radio and Shenmue II designs are all now available to purchase from the popular retailer. Not only are they available in store - you can also find them online. 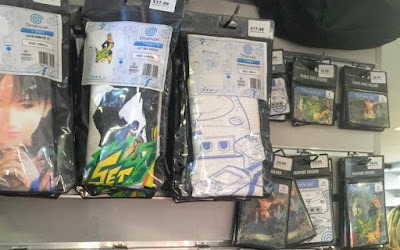 Mike went a bit overboard and literally purchased everything he could find so we'll get a full update soon on the quality of the merchandise, but if you'd like to check these out for yourself follow the links below. Not even a Clue of Jet Set Radio Future. Amazing!